This week I am sharing some sweet ideas for Valentine's Day gifties! As a thank you for inviting her to Pinterest, Ellen sent me a sample of her amazing Helliemae's Salt Caramels. Oh wow. I had the box at work and shared them with my coworkers. Everyone's eye grew round as they tasted them! "They sweet AND salty! Mmmmm mmmm mmmm!" The caramels are not only delicious but I love the story behind how Ellen started making them and the care that goes into each caramel. 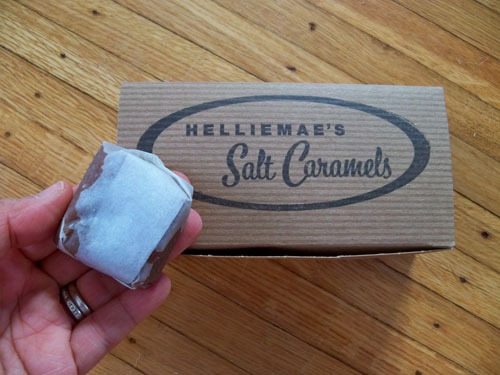 Maybe this year instead of a box of chocolates, delight someone with a box of Helliemae's salt caramels!